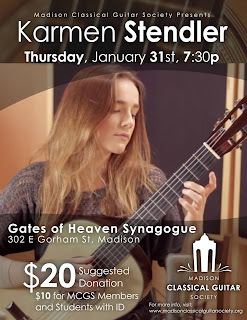 MCGS is very excited to present Slovenian guitarist Karmen Stendler as our first official concert of 2019. Please check out some of these links for more info and I hope to see you there! Madison Classical Guitar Society. Simple theme. Powered by Blogger.